Feel free to discuss the BT Software Update 31.108.0 / 3.5.136 in this thread. Just checked and I've got it and I must say the guide is working very well and does not spill or hide the next program. We have it too and the initial thoughts are what? and why? When looking at the guide, you are presented with a big white tile that is about 25% occupied with "information"
So, Question Time that I already know is hosted by David Dimbleby says words to the effect "tonight's show is hosted by David Dimbleby who is joined on the p........"
So I have to press "I" anyway to find out who's on the panel. Either use the panel space available or give us the option to disable it. I have intermittent internet access where I live. This means that I regularly get a large black bar across the bottom 1/3 of the screen saying that I can't access the internet. I can't get rid of it by pressing the back button. If i press youview and then back it goes and then comes back. It always happens when I try to access the guide which means I can't see what the guide says. 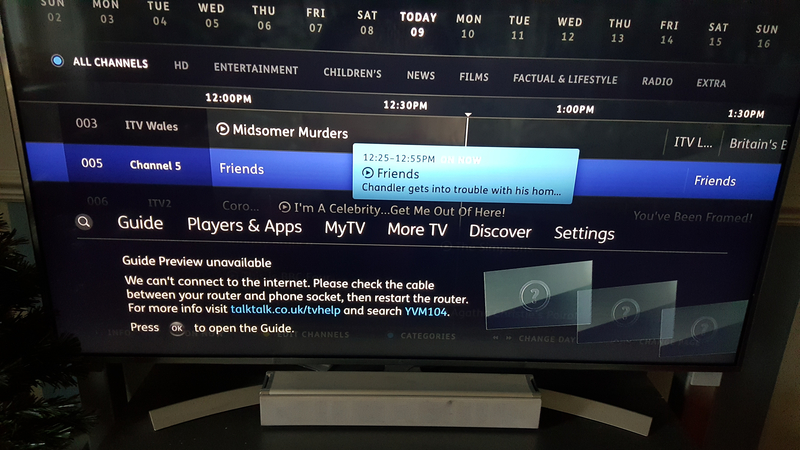 Hi @Minto and @John L, YouView is designed to require the internet now, and when it can’t show you a row of pretty thumbnails, you get the placeholder message shown; it’s not a black bar as such. To continue the RAC analogy, complaining about how YouView handles this is a bit like complaining your car won’t go when there is no petrol in the tank. So, why have you got intermittent internet, and why do you tolerate this, when presumably you are paying your ISP for uninterrupted internet? Well just updated to this version & the change to the Guide is nowhere near as bad as I thought it would be. I tend to use the Guide on the app so I wasn't too concerned by this change. Obviously the reduced timeout on playback is welcome. Might even do my T2100 now. Why oh why do we have this latest update which has a huge white box, which covers other information, and shows nothing more than the normal info. Please, please, cancel or replace this update, returning the menu to the previous version, without! The big white box!!!!! I should have added that as far as I can tell that Guide change is on no practical use to man nor beast and clearly has upset quite a few users while pleasing less. Well done Youview. Recent update on extra information on current program - finding it difficult to navigate and see other programs and info. How do I switch it off and return to the old style? AR chopped off the ending? Badger YouView to make this switchable, or to drop it altogether as a design mistake of the first water. This is a pointless and very annoying change. The channel guide was just fine the way it was. Can we PLEASE get rid of this update, or provide a means of switching it off. Thats nothing to do with this update or any other. Best to check your aerial signal strength and quality and check for recording clashes. What rules did your TiVo have that you think were better? The YouView box doesn’t work like that, though. You can’t add a recording that’s going to clash, so you know straightaway you have to do some rescheduling if you want to capture it. The only place that prioritising rules even come into play is when programmes are moved around after you have scheduled them, or they overrun, or a failed recording is to be replaced by recording a reshowing. But you didn’t mind every time you added a series on the TiVo, faffing around to decide exactly where in the list it should go? Or didn’t it work like that? Is version 31.108.0 / 3.5.136 still only for the DTR4000 as stated on the version summary page, or is it being rolled out to the T2100? Asking because over on the Plusnet TV forum there's a chap whose BT badged 2100 updated its software yesterday, to a version with a purple themed epg with BT logo and white programme info box. In doing so it has lost all the PNTV additional channels (and recordings therefrom). My own 2100 is still on version 31.69, with a blue(ish) epg and dark info box, and Youview, not BT, logo. 31.108.0 / 3.5.136 for the T4000s and 31.69.0 / 3.5.132 for the T2100/T2200 are equivalent versions and you will see the same features. The BT branded skin (as shown in the screenshots for both this and 31.69.0 software update pages come from your ISP config - if you are on a BT line you will see this theme. If you have a different supplier you may see the YouView skin - this is normal behaviour. Both of these versions were released in November/December last year so it is unlikely, if the user has had their box connected to the internet since then, that the box will have only just updated. It is possible the user's box has run itself into an issue which only a software reset can fix - and this software reset has not picked up the correct ISP configuration since, resulting in the loss of channels. However, without seeing the issue it is difficult to be certain, but if the user were here we would most likely recommend a maintenance mode reset. I hope this clears things up for you.